Occasionally I get opportunities to write sponsored posts about products or services. When I feel like the product might be something that you readers would enjoy, I pass them along in posts that I call Sponsored Saturdays. This sponsorship is brought to you by Certified Steak & Seafood Company who we have partnered with for this promotion. Certified Steak and Seafood is an online company that sells high quality meat and seafood. It was started by three brothers from a family with three generations of experience in importing seafood and selling it wholesale. They started Certified Steak and Seafood to sell their products online directly to people instead of to restaurants, resorts, hotels, etc. I got a chance to try some of their products, their filet mignon and their Chilean sea bass, recently and they aren't kidding when they say they have the highest quality products available. I've had some great steaks in my life and the filet mignon they sent is up there as one of the best I've ever had. The Chilean sea bass was something I was less excited to try since I don't often eat fish but I might have liked it even more than the steak. It was buttery and rich and not too fishy for my taste. The best part about cooking with such amazing cuts of meat is that simple is usually best. Just a little salt, pepper and some olive oil are really my favorite way to enjoy the flavors of the steak and sea bass that came through. 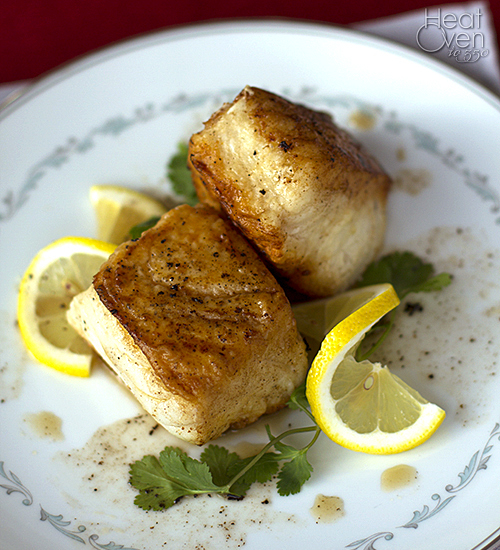 I'm sharing the recipe I used for sea bass at the end of this post. If you are looking for something special yet easy to cook for Valentine's Day instead of fighting a crowd at a restaurant, something from Certified Steak and Seafood would be perfect. It comes right to your door and requires very little work to taste completely amazing. In fact, that is what my husband and I are planning to eat for our Valentine's Day dinner. Make sure you used the code FBR125D for $25 off your order. Place flour in a shallow bowl. Coat each fillet with seasoned flour and shake off excess. Heat a large non-stick skillet over medium heat for 3 to 4 minutes. Add olive oil. Add the fillets, increase heat to high and saute, shaking the pan from time to time, until the bottoms are nicely browned, about 3 minutes. Turn and brown the other side. Remove the fish to a plate and keep warm in the oven. Repeat with remaining fillets. Deglaze the pan with the chicken broth. Cook stirring over high heat until reduced by about 1/3. Stir in butter and season with salt to taste. Remove fish from oven, plate and drizzle sauce around each fillet. If there was ever a steak that you will believe can “melt in your mouth” the Certified Steak and Seafood Prime angus Filet Mignon is it. With a delectable almost sweet beef flavor, and a strong buttery undertone that only Prime angus offers, it has to be tasted to be believed. Each Prime angus filet is slow aged, custom cut and trimmed for consistency in color and quality. It is a flavor you will remember long after your meal is over. Great accompanied by grilled root vegetables and horseradish mashed potatoes. That fish looks amazing! I am always disappointed by the thin filets at my local store, but those are just perfect. We almost always do some kind of red meat for V-Day dinner at home, but I might need to re-think the fish thing this year! Chilean Sea Bass is one of the few fish that I'll eat. It's texture is just amazing. Lucky you that you got to sample these two awesome products. Yum! This looks absolutely wonderful! yum! My mouth is watering at the look of that filet, but your sea bass is stunning! Such an elegant meal for Valentine's Day, too. Thanks for sharing your review!